TheSantaVideo.com allows parents to create a video of Santa Clause visiting your very own home! Making Christmas morning even more magical! Just by uploading a picture of your Christmas tree in your own home you can create high quality video. TheSantaVideo.com utilizes green screen technology and is extremely easy to use. Parents, Grandparents or anyone who would simply uploads a picture from their home, then selects one of many Santa Claus scenario and the magic of TheSantaVideo.com‘s software brings Santa Claus right into your own home. You can then stream your video Christmas morning to allow your children to see that Santa visited their home. You also burn the video to a DVD and save for your children to have as a keepsake. When you create a video using TheSantaVideo.com you receive your video instantly by email so it is the perfect last minute gift for anyone. TheSantaVideo.com is family owned and operated and has been bringing smiles to the faces of little ones since 2009 and love helping keep the magic of Christmas alive in children. TheSantaVideo.com is offering a $4.00 savings on your video if you like their facebook page. TheSantaVideo.com is going to make five (5) of our readers winners! Each winner will receive a code that allows them to make their own Santa Video to share on Christmas morning with their children! Winner will be chosen on December 23, 2011. Click here to enter to win your own Santa Video! services I use personally and believe will be good for my readers. limitless ways including burning to DVD for Christmas morning. Cool Gear is an innovative company that offers an array of festive food and beverage storage products. Whether you’re looking to entertain guests with festive spritzers, enjoy a wintery hot cocoa on your morning commute, or simply become immersed in the enchanting holiday season Cool Gear has you covered. Cool Gear also has a full line of water filtration bottles, Ez Freeze gear, Eco friendly products, Kid friendly products and so much more. I love drinking coffee, tea and hot chocolate especially on the go during the winter. I have found it very hard to find a cup that does everything that I want it to do. Either the cup leaks, doesn’t keep my beverage warm or the worst burns my hand when holding it because its not insulated. The Eco 2 Go Printed Holiday Mug is my must have mug. It has everything I want. With its double-wall insulation I don’t have to worry about my hand getting burnt from holding the cup or have to wear gloves to protect my hand. 🙂 Plus it has a spill-proof lid so I don’t have to worry about it leaking. The Eco 2 Go Printed Holiday Mug comes in various printed graphic designs including red and green ornaments, blue snowflakes, red and green stripes, and a Christmas tree. My favorite is the Snowflake. Plus the band is reversible so it is perfect all year long. The Eco 2 Go Printed Holiday Mug is the perfect eco-friendly option to transport your favorite cocoas, ciders or coffees. Alexandria loves drinking her beverages with a straw. 99% of the time this means she is going to play with her straw and that usually means spilled drinks and messes. I love the Eco 2 Go Holiday Chillers. The cup has double-wall insulation, saving my furniture from white rings. 🙂 The cup also features the screw on lid and keeps the straw inside the cup. The Eco 2 Go Printed Holiday Chiller is available in 4 Holiday Designs. Bluesnowflake, red and green stripe, holly and Christmas-themed polka dot designs. The Eco 2 Go Printed Holiday Chiller holds 24 ounces of your favorite beverage. Cheyenne fell in love with her new Holiday Ez Freeze Cool Zooey! She loves snowmen so it was perfect for her. It even has a rubber grip to make it easy for her to hold. Of course Cheyenne being a two year old the cup was dropped several times and even thrown a couple but the cup didn’t break or lose it durability. I love the fact that it doesn’t leak and that it has a non-toxic freezer stick to help keep her drinks cold. Cool Gear Holiday EZ Freeze Cool Zooey cup come in three colors and and three adorable flip-top options. Kids can choose from snowman, polar bear and Santa Claus. 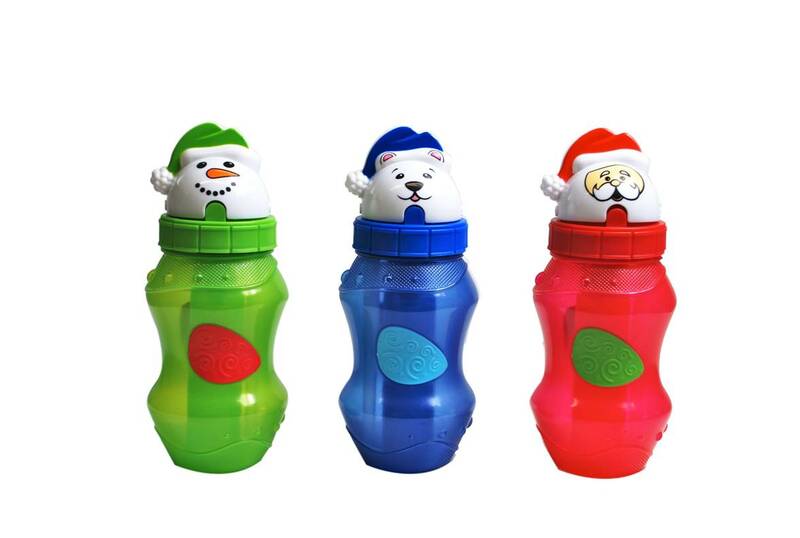 The Holiday Ez Freeze Cool Zooey cup holds 12.5 ounces of your child’s favorite drink.